We verify the correctness of an SRT division circuit similar to the one in the Intel Pentium processor. The circuit and its correctness conditions are formalized as a set of algebraic relations on the real numbers. 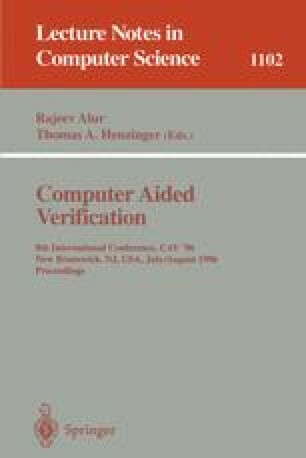 The main obstacle to applying theorem proving techniques for hardware verification is the need for detailed user guidance of proofs. We overcome the need for detailed proof guidance in this example by using a powerful theorem prover called Analytica. Analytica uses symbolic algebra techniques to carry out the proofs in this paper fully automatically. This research was sponsored in part by the National Science Foundation under Grant No. CCR-9217549, by the Semiconductor Research Corporation under Contract No. 94-DJ-294, and by the Wright Laboratory, Aeronautical Systems Center, Air Force Materiel Command, USAF, and the Advanced Research Projects Agency (ARPA) under Grant No. F33615-93-1-1330.